The NGO Common Cause has filed a PIL challenging the decisions of Central Vigilance Commission and Central Government to divest Alok Verma of powers as CBI Director. The petition also seeks a direction for the removal of CBI’s Special Director Mr. Rakesh Asthana from the CBI "in light of serious corruption cases pending against him in order to ensure institutional integrity". The Petition also seeks constitution of a Special Investigating Team to look into the recent unprecedented events in CBI and also to investigate the allegations of corruption against the senior officials of the CBI and submit the report before the SC. The PIL filed through Advocate Prashant Bhushan alleges that "the chain of events shows that Mr. Alok Verma is being victimised for taking action against Mr. Rakesh Asthana, a Gujarat cadre officer and also for entertaining complaint against the top functionaries of the present government". It is narrated in the petition that Verma had raised objection, at the time of appointment of Mr. Rakesh Asthana as Special Director CBI, when he was consulted by the Appointment Committee of the Cabinet in October 2017, on the ground that Mr. Asthana’s name was also figuring in some of the corruption cases which were being investigated by the CBI itself. "On 30.08.2017, the CBI’s Delhi Unit registered an FIR against three senior income tax officials for allegedly accepting bribes from the Gujarat based Sterling Biotech and Sandesara Group of Companies. Apparently, these income tax officials, despite conducting a raid in 2011 in the premises of the Sandesara group and procuring a diary containing the details of daily financial dealings and cash transactions in favour of certain named individuals and public servants, had not taken any action against the persons named in the diary. Apparently, the said diary contains the name of Mr. Asthana also who at that point in time was posted as Police Commissioner at Surat", states the petition. It is clarified in the petition that idoes not seek to agitate the same cause as was put forth before in the earlier Writ Petition filed by Common Cause against the appointment of Asthana as Special Director, which was dismissed on November 29, 2017. It is stated that the present petition seeks his removal from CBI owing to subsequent developments, and does not challenge his appointment. 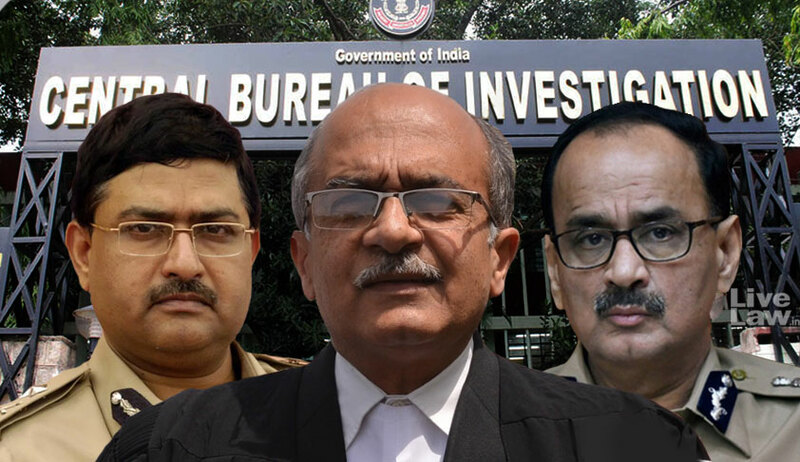 It states that "Asthana's continuation as Special Director, CBI is compromising the institutional and impeccable integrity of the entire organization". The petition points out that Verma had caused the registration of FIR against Rakesh Asthana on the basis of complaint of one Satish Sana alleging payment of bribes to Asthana. The impugned orders were passed on the night following the day when Asthana approached the Delhi HC against the FIR and obtained interim protection from arrest until October 29. "The odd timing of the late midnight orders also confirms that they are made mala fide", states the petition. The petition contends that removal of Alok Verma is contrary to the provisions of DSPE Act and also the directions of the SC in Vineet Narain case. The removal violates the rule of fixed tenure of CBI director, and is made without the consent of the High Powered Committee comprising PM, Leader of Opposition and Chief Justice, which appointed the Director. Challenges Nageshwar Rao's Appointment As Interim Director. The petition also challenges the decision to hand over the charge of CBI Director to Nageshwar Rao. It is stated that "Mr. Nageswar Rao’s appointment as acting director is bad in law, there is an online investigation report published on www.savukkyonline.com, which enumerates various lapses and instances of unprofessional conduct on the part of Mr. Nageshwar Rao which merits further investigation. As per the report, Mr. Alok Verma had apparently ordered a discreet enquiry against Mr. Rao, when he was posted as Joint Director, Chennai Zone, CBI and had ordered transfer of the investigation of important cases from Chennai Zone of CBI to Banking and Securities Fraud Cell of Bengaluru". The petition also points out that officer who was investigating the case against Respondent No.4 has been transferred to Port Bliar with immediate effect in a completely mala fide manner on 24.10.2018. Also, the whole team working under the CBI Director has been transferred out of Delhi with immediate effect. On this premise, the petition highlights the need to have a court monitored probe by SIT into the malpractises within CBI. "An independent investigation into the aforementioned allegations of corruption against the CBI officials and other related issues, which have unfolded in the last few days, cannot be left to the officer who has been handed over the charge of Director, CBI as he himself has been facing corruption charges and Mr. Verma had apparently ordered a discreet enquiry against him neither the CVC can be trusted for the said responsibility as his conduct has been clearly partisan in the present case", the petition states, praying for SIT investigation. When the petition was mentioned before the CJI Ranjan Gogoi today morning by Advocate Prashant Bhushan for urgent listing, the CJI said "file memo, we will look into it".